The Southern Star Group is proud to introduce the Gemini; a brand new handle and lock mechanism for both our Canterbury Timber sliding window and the Southern Star Aluminum 300 Series Sliding Window. The Gemini perfectly blends style and functionality with clever design. Engineered for smooth and simple operation, the Gemini is a sturdy yet lightweight handle that is sure to be a favourite. The centred tab releases the handle from its dock effortlessly and allows for seamless transition between open and close. 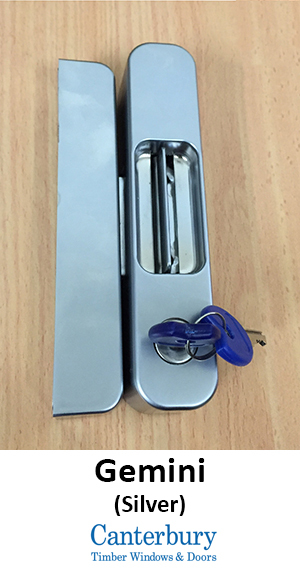 The quality of the handle is evident with an external finish of the utmost standard and the class of internal mechanism clear upon operation. A cylinder lock is offered as standard, which provides extra security and peace of mind. The keyed lock functions with ease thanks to internal technology that focuses on distinction. The Gemini now comes as standard with both the Southern Star Aluminium 300 Series aluminium sliding window (black) and the Canterbury timber sliding window in silver. For a beautiful, functional and ease of use handle that not only suits but also complements sliding windows; look no further than the Gemini. To find out more about the Star Range of hardware or any of our timber and aluminium window and door products, speak to your sales representative today.